A beautifully refurbished Edwardian upper maisonette with well thought out layout and excellent finish throughout including hard wood floors with sound insulation and good quality kitchen, bath and shower rooms. 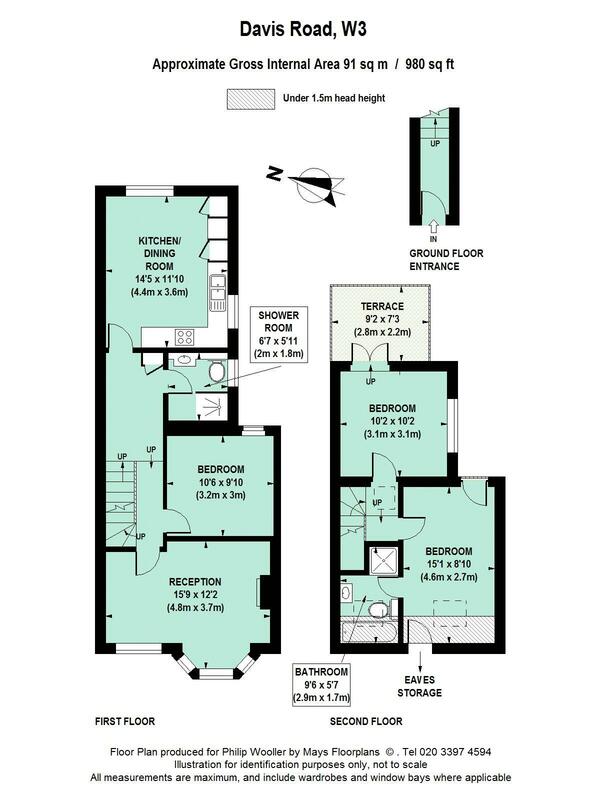 These buildings have good width and generous ceiling heights and this flat features many clever design touches, with a contemporary feel with a great balance of bedroom and entertaining space, as well as an east facing roof terrace accessed from a newly created third double bedroom. The en suite master bedroom in the main attic is wonderfully light. Situated quietly at the southern end of Davis Road which runs parallel with St Elmo Road, the property is conveniently close to the thriving Askew Road, a few minutes walk from Wendell Park and within the catchment of Southfields and Wendell Primary Schools. The shopping and transport hubs of Hammersmith and Westfield are within easy reach; the 607 bus route east along Uxbridge Road provides the fastest access to the Central Line tube. Stamford Brook or Turnham Green Terrace tubes are an approximate 15 minute walk. 980 sq ft / 91 sq m approx.